Three new Star Wars novels tell solo adventures of the "big three" characters during the Original Trilogy era. 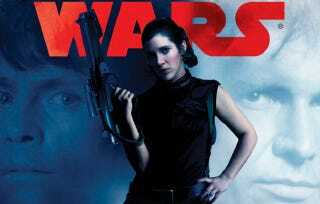 And we've got an exclusive look at the Princess Leia novel, in which she's got a mighty big gun. STAR WARS: EMPIRE AND REBELLION: RAZOR'S EDGE by Martha Wells. The book is a Princess Leia adventure that will also include Han Solo and Luke Skywalker and is set after A New Hope. EMPIRE AND REBELLION is the title for a trio of stand alone novels focusing on Leia, Han, and Luke. Martha Wells is writing the Leia novel, James S. A. Corey is writing the Han Solo novel, and Kevin Hearne is writing the Luke novel. RAZOR'S EDGE is due to hit stores this October. Kind of excited to read a Han Solo novel by the author(s) of Leviathan Wakes.